DURHAM, N.C. -- The Egyptians supposedly used it to guide the construction the Pyramids. The architecture of ancient Athens is thought to have been based on it. Fictional Harvard symbologist Robert Langdon tried to unravel its mysteries in the novel The Da Vinci Code. The natural design that connects vision and cognition is a theory that flowing systems -- from airways in the lungs to the formation of river deltas -- evolve in time so that they flow more and more easily. Bejan termed this the constructal law in 1996, and its latest application appears early online in the International Journal of Design &amp; Nature and Ecodynamics. Bejan argues that the world – whether it is a human looking at a painting or a gazelle on the open plain scanning the horizon – is basically oriented on the horizontal. For the gazelle, danger primarily comes from the sides or from behind, not from above or below, so their scope of vision evolved to go side-to-side. As vision developed, he argues, the animals got “smarter” by seeing better and moving faster and more safely. 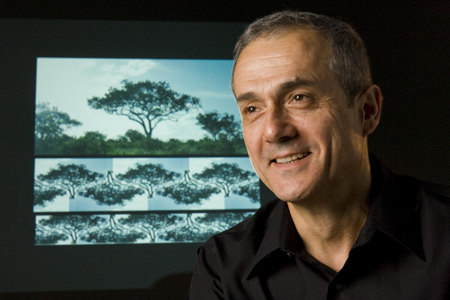 In numerous papers and books over past decade, Bejan has demonstrated that the constructal law predicts a wide range of flow system designs seen in nature, from biology and geophysics to social dynamics and technology evolution.